the Knowledge Centre has what you are looking for. 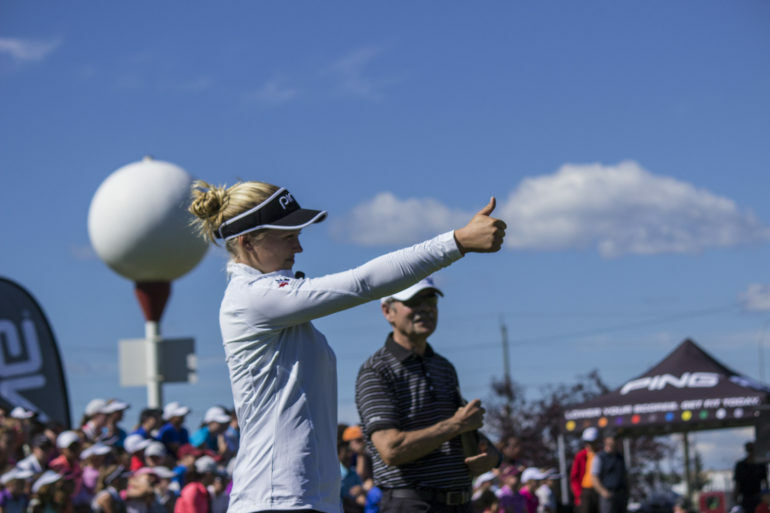 For clubs or committees in charge of competitions, the Conditions of Competition and Standard Local Rules that Golf Canada implements at all championships is posted for your reference. In addition, a list of local rules that should be considered is available on the Golf Canada website. Purchase Rules of Golf book! The official guide will be available for purchase through the Golf Canada Shop in October. 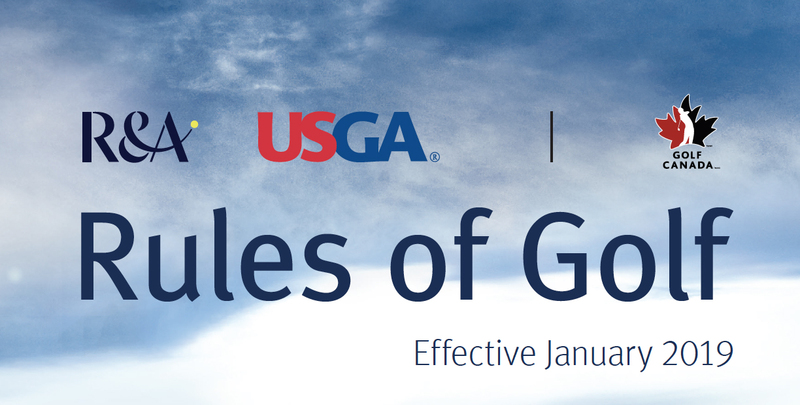 Please use the links below to view the official R&A or USGA Rules of Golf apps. Think you know the 2019 Rules of Golf? Test your knowledge using the below links to online quizzes. Visit the Golf Canada Rule of Golf Page to view additional resources, including info graphs and links to additional rule modernization items. Level 2 (provincial certification) seminars will be conducted by provincial golf associations, and the curriculum will begin to look at the more important playing Rules in detail. Some of the complexities that are found in the Decisions book are introduced along while also implementing on-course demonstrations. Level 2 (Provincial) will be designed for individuals with an involvement in tournament administration, or a desire to have such an involvement. Use the links below to register now! Golf can be a repetitive sport. Especially when you default to individual stroke play every time you step onto the first tee. Mixing up the format can be a fun way to introduce beginner’s to the sport, and renew your love of the game as well! Did you know that matchplay and alternate shot are very popular in Europe? It gives you the feeling of playing against your opponent(s) and less against the course, it also improves pace of play. If that doesn’t interest you, take a look at the games listed below. Don’t be afraid to make up your own game! No disturbance or distraction. Players should always show consideration for other players on the course and should not disturb their play by moving, talking or making any unnecessary noise. Players should ensure any electronic device taken onto the course do not distract other players. On the teeing ground, a player should not tee his ball until it is his turn to play. Players should not stand close to or directly behind the ball, or directly behind the hole, when a player is about to play. On the putting green, players should not stand on another player’s line of putt or when he is making a stroke, cast a shadow over his line of putt. Players should remain on or close to the putting green until all other players in the group have holed out. Repair of Divots, Ball-Marks and Damage by Shoes Players should carefully repair any divot holes made by them and any damage to the putting green made by the impact of a ball (whether or not made by the player himself). On completion of the hole by all players in the group, damage to the putting green caused by golf shoes should be repaired. Preventing Unnecessary Damage Players should avoid causing damage to the course by removing divots when taking practice swings or by hitting the head of a club into the ground, whether in anger or for any other reason. Players should ensure that no damage is done to the putting green when putting down bags or the flagstick. In order to avoid damaging the hole, players and caddies should not stand too close to the hole and should take care during the handling of the flagstick and the removal of a ball from the hole. The head of a club should not be used to remove a ball from the hole. Players should not lean on their clubs when on the putting green, particularly when removing the ball from the hole. The flagstick should be properly replaced in the hole before players leave the putting green. Local notices regulating the movement of golf carts should be strictly observed. The relative difficulty of a golf course is determined jointly by Golf Canada and the provincial golf association using the Golf Canada Course and Slope Rating System. Specially trained Course Rating Teams evaluate the difficulty of a golf course based on such variables as length and a number of obstacle factors (e.g. topography, bunkers, water hazards, severity of rough, etc). Only Golf Canada member golf clubs are permitted to use the Golf Canada Handicap System and Golf Canada Course Rating System and related trademarks and service marks and must do so in a manner that preserves the integrity and reliability of these systems. All rights to use these systems and related trademarks and service marks terminate should the golf club cease to be a member in good standing with Golf Canada. The Member Club Handicap License Agreement stipulates that every Alberta Golf / Golf Canada Member Club must have a representative attend a handicap seminar and complete the certification exam. We host several Handicap System Certification Seminars each season in order to educate and help clubs and individuals achieve certification and compliance. These Seminars are a more in-depth look into Handicapping and Course Rating and will give attendees a thorough knowledge of the Golf Canada Handicap and Course Rating systems. The Handicap Seminars are beneficial for club members, Handicap Committee members, Golf Professionals, Superintendents, General Managers, and others interested in learning more about Handicapping in general. These seminars are typically scheduled in the evenings and include a copy of the Golf Canada Handicap Manual and other relevant Handicap materials. Attendees who participate in the Seminars take a short exam to become Golf Canada Handicap System Certified. Upon successful completion of the Seminar and exam, a certificate of completion is sent to the newly certified Official. Golf Canada offers Online Handicap Seminars available to complete at any time. The seminar will take approximately four hours, but you are able to bookmark your place and come back to it at your own convenience. Equitable Stroke Control (ESC) is the downward adjustment of individual hole scores for handicap purposes in order to make Handicap Factors more representative of a player’s potential scoring ability. It sets a maximum number that a player can post on any hole depending on the player’s Course Handicap. The purpose of the Golf Canada Course Rating System is to measure and rate the relative difficulty of golf courses across Canada so that a player’s Handicap Factor is accurate and transportable from golf course to golf course. The Course Rating System takes into account factors that affect the playing difficulty of a golf course including yardage, effective playing length and number of obstacle factors such as topography, elevation, doglegs, prevailing wind, bunkering, etc. After a thorough study of the Course and Slope Rating System developed by the United States Golf Association (USGA), Golf Canada approved and adopted the system for Canada in January 1995. Golf Canada Course Rating – the evaluation of the playing difficulty of a course for scratch golfers under normal course and weather conditions expressed as number of strokes (e.g. 72.5). Golf Canada Slope Rating – the evaluation of the relative difficulty of a course for players who are not scratch golfers compared to the difficulty of the course for scratch golfers. The lowest Slope Rating is 55 and the highest 155. A course of standard playing difficulty will have a Slope Rating of 113. Every member golf course should have an Golf Canada Course Rating and Slope Rating for each set of tees at the course. These ratings are used in the calculation of the Golf Canada Handicap Factor and for determining a player’s Course Handicap for a given round. Accuracy and consistency are the keys to effective course rating. 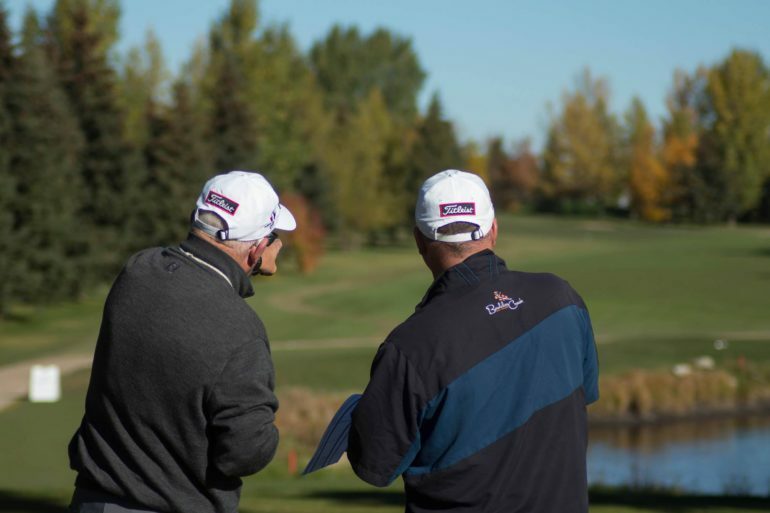 Alberta Golf rates golf courses in accordance with the system and this ensures that Course Ratings are accurate and uniform from coast to coast. Only an Alberta Golf team of course raters may rate golf courses. The Alberta Golf Hall of Fame honours the legacies of men and women who have made a difference on the Alberta golf scene either as a skilled player, through distinguished service, or as a builder. Please click the Player and Distinguished Service Inductees links to view the current members of the Alberta Golf Hall of Fame and their distinguished careers. Nomination forms must be submitted by June 1st each year for consideration. Please contact us to receive a copy of the updated nomination forms.